Moscow and Kabul reached an agreement on repairs of Russian helicopters in Afghanistan. Moscow and Kabul reached an agreement on the maintenance and repairs of Russian and Soviet produced helicopters in Afghanistan, Maria Zakharova, a spokeswoman for the Russian Foreign Ministry, said on Dec. 7. Army Gen. John Nicholson, the commander of the Resolute Support mission and U.S. 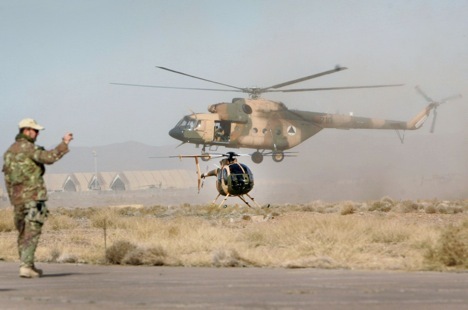 Forces in Afghanistan, announced earlier that Russia had been allegedly refusing Kabul to settle the problem of repairing Russian helicopters, which used up their service life. "It seemed that Afghanistan had been allegedly turning for help and Russia allegedly failed to provide this assistance," Zakharova told a press briefing. "The lack of seriousness in these statements can be backed up by the fact that several weeks ago Moscow and Kabul reached an agreement, which stipulates Russia’s military and technical assistance to Afghanistan, including maintenance and repairs of military hardware, manufactured either by Russia or the former Soviet Union," she said. "By the way, Nicholson has acknowledged the fact that Russia’s military and technical assistance to Afghanistan was hindered by U.S. sanctions over Crimea and Ukraine," the spokeswoman for the Russian Foreign Ministry added.